Cracks in Kitchener Foundation Walls - Are they Serious? No matter how young or old a home is, cracks are common in concrete, and many of them aren't a problem. Concrete can develop smaller hairline cracks as it cures -- and it can continue to cure for many years after the home is built. 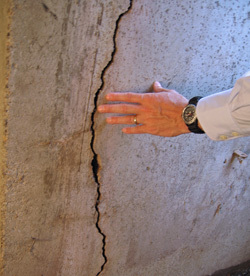 When cracks appear, Advanced Basement Systems is here to help. Our foundation repair contractors are trained and ready to help you evaluate the cracks in your foundation walls. For a free foundation repair quote, call or e-mail us today! We serve Ontario, including London, Windsor, Chatham, Sarnia, Stratford, Windsor , Leamington, St Thomas, Amherstburg, Strathroy, Essex, Ingersoll, Kingsville, Aylmer, Goderich, Hanover, Listowel and areas nearby. In many cases, the foundation wall crack has been there for quite some time and hasn't happened overnight. However, it's important to treat each foundation crack you find as a potentially serious problem. Your first step should always to be to consult a professional for an inspection. Monitor any cracks you find regularly. If you suspect that the crack is moving, spreading, or widening, then this is a strong indication that you have a problem. In this case, your basement or crawl space could be experiencing a foundation settlement issue, which will lead to increased damage to the home over time. Keep an eye on the crack by marking the ends of the crack with a pencil. Then, draw several straight "alignment" marks along the width crack, recording the date next to every mark. If you find that the ends of the lines don't meet along the crack, then this may indicate the the crack is not shifting evenly, and a professional should be contacted. 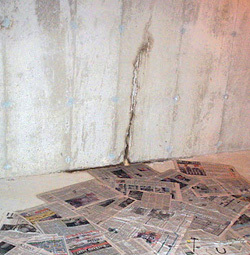 Foundation wall cracks can sometimes develop leakage, as groundwater invades from around your foundation. This can be extremely frustrating and inconvenient for homeowners, leading many of them to try to plug the crack with epoxy injection. When epoxy hardens, it forms a strong bond in the concrete, hardening into a rigid seal. 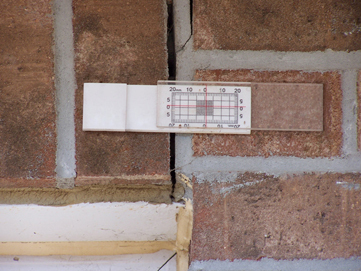 However, foundation walls shift and expand with moisture levels and temperature. When the wall moves, the epoxy cannot. In the end, one of two things will happen: the epoxy breaks loose, or a new crack forms in the wall. Leaking foundation wall cracks do not necessarily mean that a more serious foundation problem is present -- some leaking wall cracks are not due to a structural issue at all. However, it's certainly worth having a contractor inspect and repair these wall cracks. Most home wall crack repair methods -- such as epoxy, urethane, hydraulic cement, and caulk -- are not effective ways to eliminate this water. If you do have a foundation problem in your home, it's very important that you repair it as soon as possible. If a foundation issue is identified early enough, it should be possible to repair the problem without digging out the foundation and rebuilding the structure. This is a much less costly, invasive, and time-consuming repair, so it's important to catch the problem as soon as you can. Additionally, repairing the foundation without rebuilding it will address the problem that caused the foundation issue. Rebuilding the foundation replaces the failed foundation wall with a new one - one that faces the same conditions that destroyed the original wall. Advanced Basement Systems of Ontario uses a variety of foundation repair products to address foundation structural issues, including foundation wall anchors, foundation push piers, and foundation helical piers. When a trusted foundation specialist meets with you, they can identify and explain the nature of your problem, suggest a solution, and explain why this solution will lead to lasting results for your home. If you live in the Ontario area, Advanced Basement Systems would like to offer you a free, no obligation foundation repair quote. Each estimate includes an on-site inspection, a personal consultation, and written proposal. 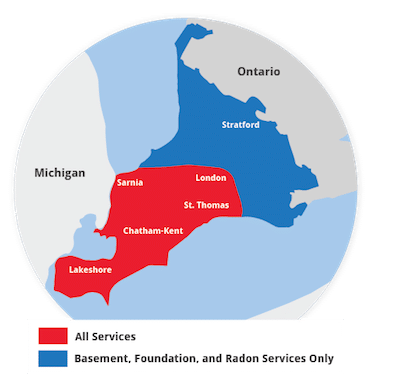 We serve a wide area, including Chatham, London, Sarnia, Windsor, Stratford, Windsor , Leamington, St Thomas, Amherstburg, Strathroy, Essex, Ingersoll, Kingsville, Aylmer, Goderich, Hanover, Listowel and many areas nearby. Call or e-mail us today!